MANALAPAN, N.J. -- The Elevate Hoops Summer Icebreaker I is one of two tournaments being held at Sportika Sports Complex this week, the first of three five-day periods this month where Division I coaches can be out on the road watching and evaluating high school prospects. Imagine being a freshman guard, standing 6-foot-tall, only knowing how to play the guard position. And then, as a junior, you’re standing 6-9 and having to learn how to play a completely different position. For Christian Brothers Academy junior Joshua Cohen, that was the situation that his body threw at him over the past year-and-change. In basketball, height is the one variable that can really put you at an advantage or a disadvantage when it comes to college recruitment, depending on the situation. Thankfully for Cohen, his height is now putting him at an advantage for colleges to reach out to him. While Cohen has not received a scholarship offer just yet, he has received interest from schools such as New Hampshire and Holy Cross. “When I was 6-4, I was not getting any college interest but with the growth spurt I was getting a lot of calls and texts and emails from different schools,” he said. Even Cohen’s AAU team, the Jersey Shore Warriors, did not have Cohen on their radar until he hit his growth spurt this past season. 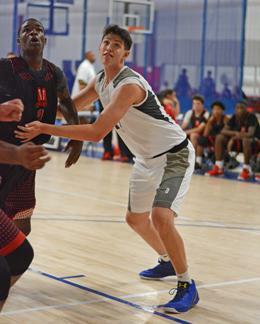 Though he had a rough intro to the guard-oriented team during the April live periods, several months playing with the Warriors during tournaments in May and June has him feeling much more comfortable back out in front of coaches this time around. The Jersey Shore Warriors looked absolutely fantastic in their rout of Achieve More on Wednesday night, with a final score of 92-47. Cohen had his part in the offensive explosion, including a 3-point play in the second half and a few other buckets on dump-offs, knocking down one mid-range jumper as well. As Cohen is still transforming into his body, he still has some kinks to work out in his switch from a guard to a center.